The Skagit County Herald reported that American Indian tribes that meet certain criteria now have the authority to prosecute non-Indians for a limited set of domestic violence crimes, a shift supporters hope will reduce the high rate of violence on reservations. Apparently, three tribes in Arizona, Oregon and Washington state have exercised that power for more than a year under a pilot project approved by the U.S. Department of Justice. Together, the tribes have brought more than two dozen domestic violence cases against non-Indians who live or work on their reservations, according to the National Congress of American Indians. In Washington, the Tulalip Tribe was approved as part of the pilot project in February 2014. A 1978 U.S. Supreme Court ruling stripped tribes of any criminal jurisdiction over non-Indians on their reservations. However, the Violence Against Women Reauthorization Act of 2013 allowed tribes to charge non-Indians who are married to or in a partnership with a tribal member for domestic violence crimes and violations of protection orders. The Justice Department has said that American Indian women suffer from domestic violence at rates more than double national averages. To ease concerns from some members of Congress, tribes have to ensure that jury pools include non-Indians and that their court systems afford defendants the same rights as state and federal courts do. 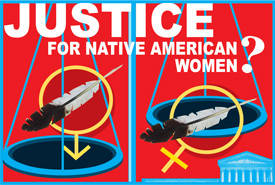 The changes to the Violence Against Women Act also allow defendants to seek review of a tribal court decision in federal court.